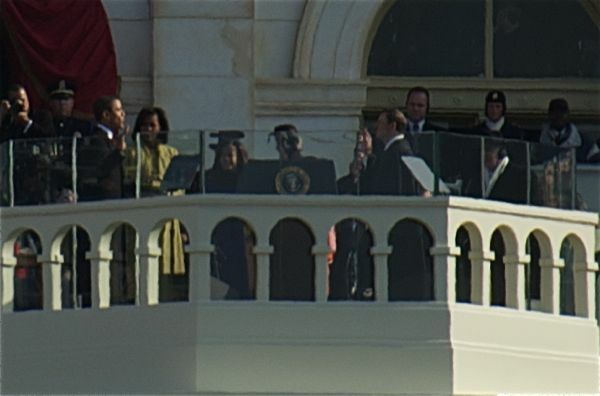 Chief Justice John Roberts messes up while administering the oath of office to Barack Obama. Disclaimer: Most of these photos are horrible because I was simply holding up my camera and snapping away. 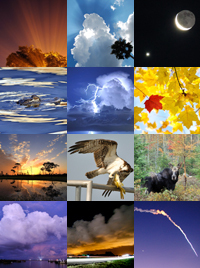 Update: Some of my photos appeared in this gallery on the U.S. News & World Report site. I started Tuesday earlier than I end most days. In order to get a good spot from which to view Barack Obama's inauguration, my TV journalist friend and I thought 3:45 a.m. would be a good wake-up time. A Senate staffer told us that even though we had tickets, we weren't guaranteed a spot. We had to get there early: His office was telling most people 6 a.m. But he was secretly telling us more like 4 or 5 a.m. I packed more clothes than normal for this trip. Why? It's cold here. The forecast was partly cloudy with a high of 32, about 40 degrees colder than what I'm used to. When I was packing in Florida, however, I stared directly at my winter hat, thought nothing of it, grabbed my gloves, packed them and moved on. It didn't occur to me that a hat would come in handy in 20-degree weather. 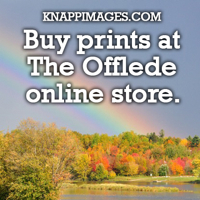 Was I really born and raised in Maine? But I have connections here in Washington, and a friend hooked me up with a knit cap, a hooded sweatshirt and a fleece-lined jacket. I had two layers on my head, seven on my upper body and three on my feat (a pair of regular socks and two pairs of thick wool socks from J.C. Penney in Bangor, Maine). But another stupid thing: I wore my usual Florida loafers. What was I thinking? 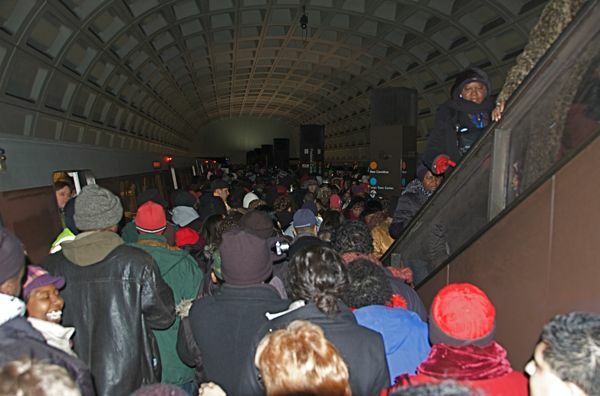 My woeful existence in D.C. continued when my friend and I tried to transfer on the Metro underground rail system. We walked out of one station and to another, only to find that all three escalators were moving upward, not down as we needed them to be. We went back to the one we exited, and it was the same situation. There was no way we were walking the rest of the way, so we ran down the upward-moving escalator. 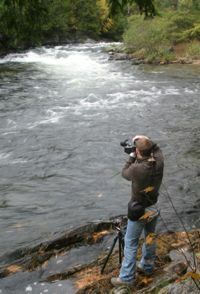 I managed to avoid falling flat on my face, smashing my Nikon. We also avoided backlash from the Metro workers. They didn't seem to notice. After getting off the Metro at Federal Center, the closest blue/orange line stop to our gate, we got in a line that went to that far wall, then hung a right and headed - finally - toward the escalator. It moved swiftly, though: We were out in about 15 minutes. We made it from Van Ness to the Federal Center Metro station, two blocks south of the National Mall. It took us about 15 minutes to get out of the station, and we learned later that it closed because of overcrowding. We also learned that an elderly lady was hit by a train in Chinatown, further delaying the rail system. The police presence was overwhelming. At least one stood on every corner of every sidewalk. The National Guard blocked roads. And the Capitol police directed pedestrian traffic near the Metro station. "Hold up now," one said. "We don't want any accidents. Too much paperwork." Other than that policeman, however, most security personnel weren't thrilled about being in the frigid air for hours on end. The sailors working the inauguration only had their uniforms to keep them warm. 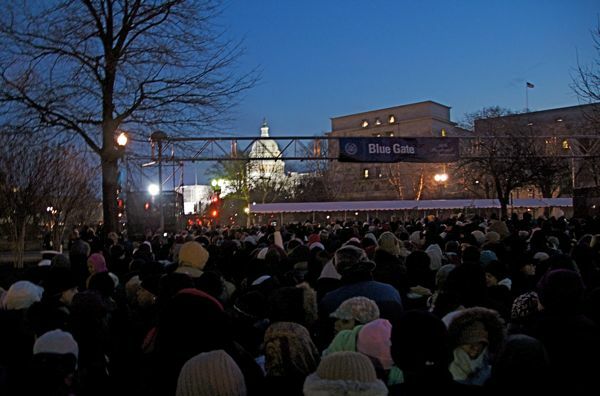 It was dark when we arrived, but the Capitol was brightly lit. We arrived early and were close to the front of the line. It stretched for blocks behind us. We made it to the Blue Gate, where ticketholders for the closest standing room possible were waiting in line to be admitted through security. We made it there around 5:45 a.m., with the gates set to open at 8, an hour earlier than was first planned. 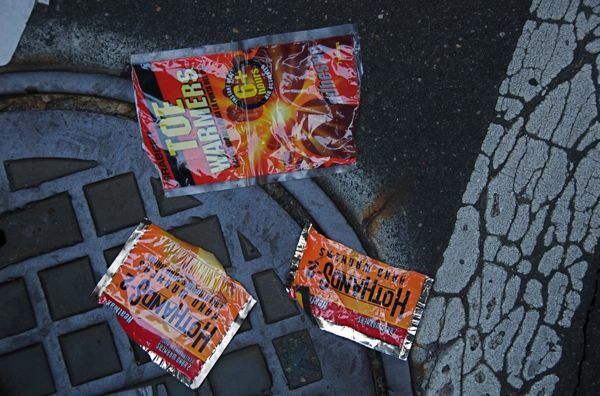 Wrappers for hand and toe warmers were thrown onto the ground. I didn't litter; I kept them in my pocket. We were close to the front, so there was little stress involved. People bobbed to stay warm. Two recent college grads watched "What Happens in Vegas" on an iPhone. Friends threw McDonald's egg sandwiches to others in the crowd. 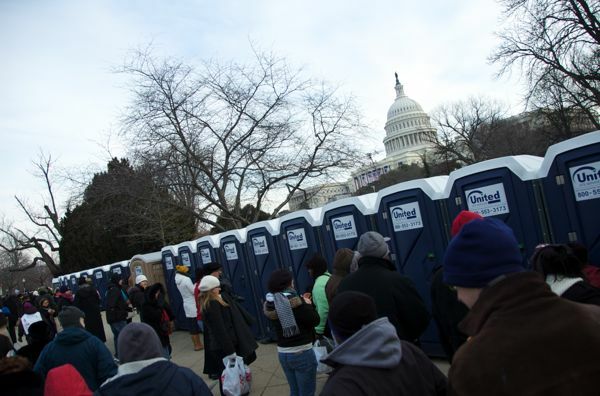 Some had coffee, though having to use a portable toilet later mostly likely would be an unpleasant experience. One man showed off the picture of himself and Obama. Several people tried to sell hand and toe warmers, Obama buttons, Obama hats and Obama shirts. We did the wave and cheered for the television cameras. Using the bathroom was likely a chilling experience. Intruders tried the usual tricks for attempting to cut in line. Some said their family was at the front. Some said they left their bags up front and had to get them; we weren't that gullible. As the sun slowly rose in the east, the dark sky behind the Capitol turned red. The lights that had been illuminating the building were turned off. 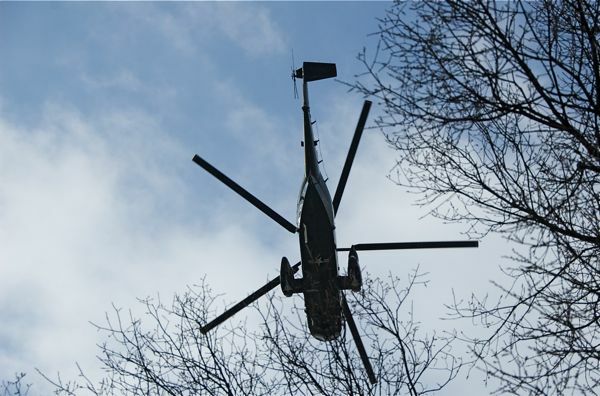 A plane circled high overhead, as security choppers covered the low-level airspace. And the president's Marine One helicopter touched down near the rear entrance. Mostly, I was toasty. But my toes were ready to fall off. The line started moving just past 8 o'clock. It wasn't gradual. It progressed in surges, raising the likelihood of a Black Friday-type stampede that would kill, in this case, several, not just one. 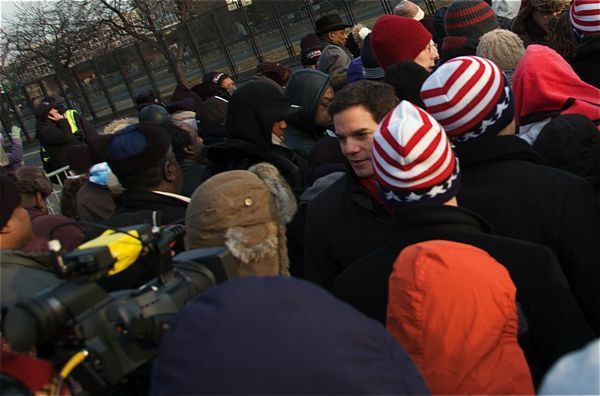 Bill Hemmer and his Fox News crew push through the crowd of ticketholders. As the people ahead of us slowly dissipated, Fox News anchorman Bill Hemmer inched by us with a sound man and a camera operator. He must of either been snubbed a press badge by the new Democratic administration or was just going for that what's-it-like-in-to-be-the-crowd piece. This isn't an airport. This is the west side of the Capitol, where TSA employees put I-Day attendees through the wringer. As we moved forward, my proximity to others kept me warm. We were packed in like sardines, as we snaked through a maze of gates that was designed to slow the line before it reached the metal detectors. I showed my ticket to about five security workers, slapped down all the metal belongings in my jacket pockets - cameras, spare batteries, memory cards and eyeglasses - then walked through the metal detector without incident. Like cows released from a corral, we were free. The seated section was mostly empty as we made it to the viewing area around 8:45 a.m.
Getting a good spot wasn't a problem. I've heard countless stories of I-Day attendees who were disappointed that they didn't get close; for us, that wasn't the case. We made it to the front of the Capitol before a vast majority of ticketholders and scored a fifth-row spot in the standing room section directly behind the chairs. It was perfect. 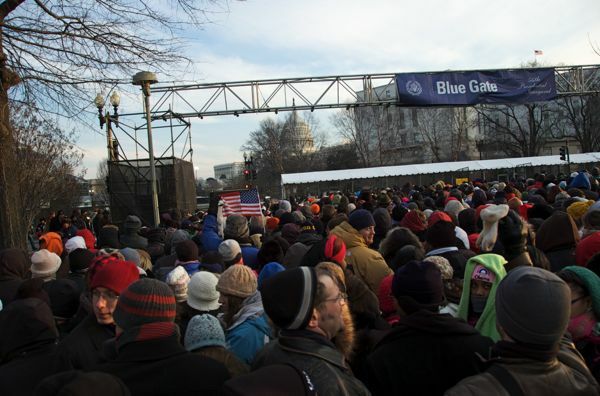 The National Mall behind us was not empty: a sea of people as far as the eye can see. You also can see people raising their arms while standing on the lion statues next to U.S. Grant. Then, I looked behind me. 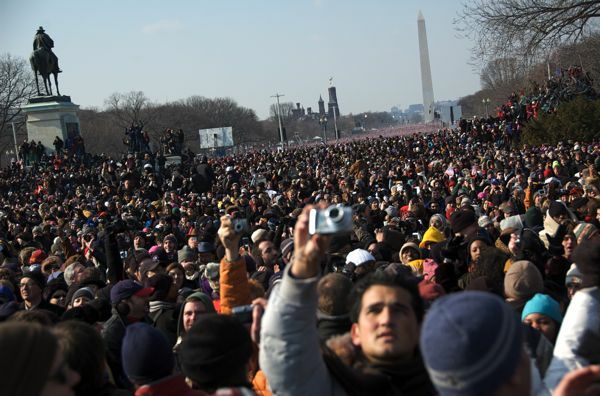 As far as I could see - to the Washington Monument - there were people. And people. So many people. Most were waving American flags that were given out as they reached the mall. And they were everywhere. In front of the Capitol's reflecting pool, along First Street, spectators climbed the statues and used them as chairs - or more like thrones; the view must have been good. The police didn't bother shewing them off. One man briefly violated (mounted) a lion statue next the mounted Gen. Ulysses S. Grant. 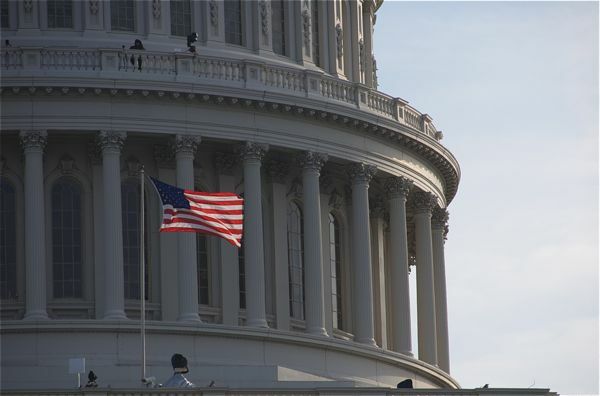 The sun brightens the sky behind the Capitol. The music made time pass more quickly. And as more people were admitted and as the midday sun reached its apex, I got warmer. The familiar campaign cheers of "O - ba - ma" and "Yes, we can" spontaneously erupted, along with the considerably less classy chant of "Hey, hey, hey, goodbye" for President George W. Bush. The morning sun strikes the Capitol dome. The standing crowd, which was most everyone, mocked the announcer when he asked them to be seated. There were about 240,000 tickets issued, and most of them were for standing room. I was lucky enough to have a clear view of the podium without standing on my toes, though I had to lift up my camera to take photos because of the angle. 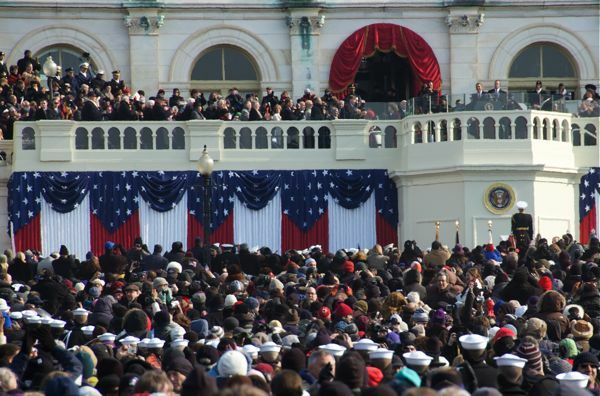 We patiently awaited Obama's swearing-in, through Aretha Franklin's shaky singing of "My country 'Tis of Thee" and Yo-Yo Ma's anticlimactic performance of a John Williams composition. I snacked on two granola bars, saving the Keebler peanut butter crackers for a time that I feel like contracting salmonella. I shoved hand warmers into my shoes, only to have them finally activate during the Metro ride home. 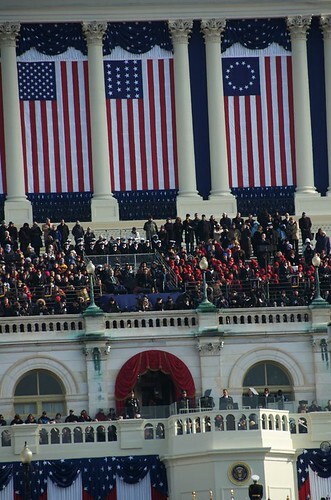 Obama, small in this photo, delivers his address. 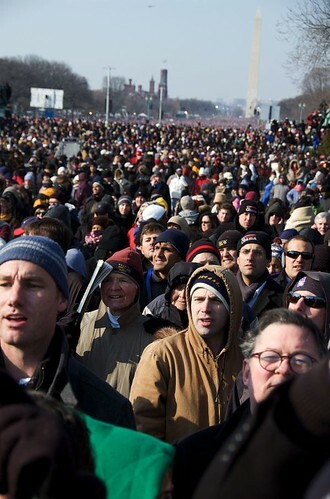 But as Chief Justice John Roberts stood for the oath, the crowd surged forward, crushing everyone into a tightly packed pen. Simultaneously with Obama, the spectators raised their rights hands, but in them were cameras, as they desperately tried to get a shot of history. We were so busy photographing that we didn't notice Roberts' botched oath-giving. That tainted an otherwise stellar day. 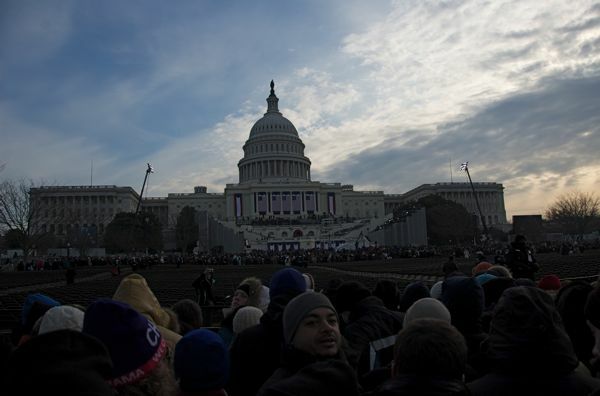 The electronic speakers behind us were delayed, so Obama's words echoed throughout the National Mall. 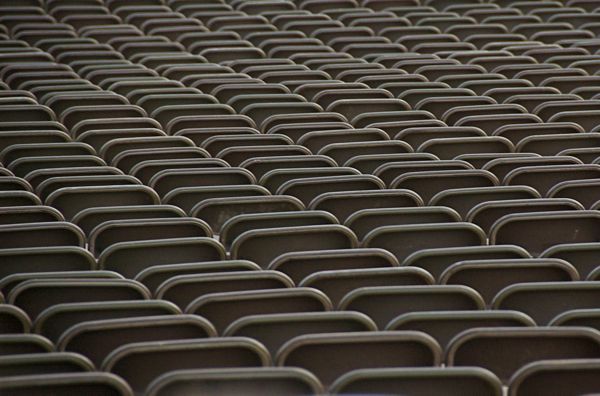 But according to the cheers I heard from behind, the people in the cheap seats were rowdier that those up front. You know it's a great country when citizens attending such a confused mess of people can find joy, optimism and warmth in bitter weather, and can know that the moment is one of the most profound in American history. And I have never heard singing like I heard Tuesday. You've never truly heard the "Star-Spangled Banner" until it's sung by 2 million people. The service adjourned, and then it was time for the mass exodus. When I started moving, the aching started, too. Knees. Back. Feet. Legs. They all hurt, frozen stiff from eight hours of standing still in sub-freezing air. The cops apparently were tired of herding crowds that wouldn't listen. They let us have at it. 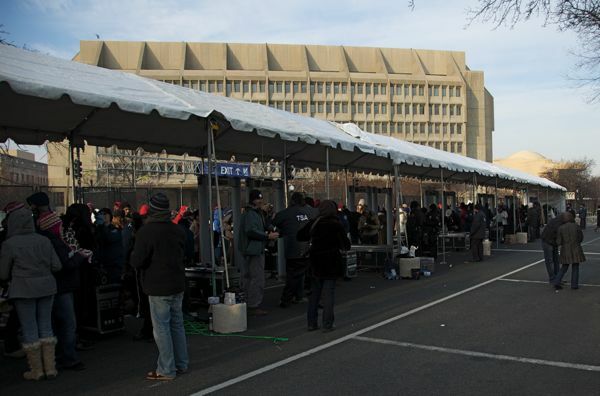 The ticketed areas in front of the Capitol were fenced, offering the same number of entrances as exits. So, we improvised. We climbed over a concrete barrier and jumped down the six-foot ledge to the sidewalk on the other side. The elderly followed the younger people who were in line to do this, and they had to turn back when they saw the hazardous nature of the great egress. But some - probably in their 60s - managed to make the leap without injury. I'm guessing others weren't as fortunate. 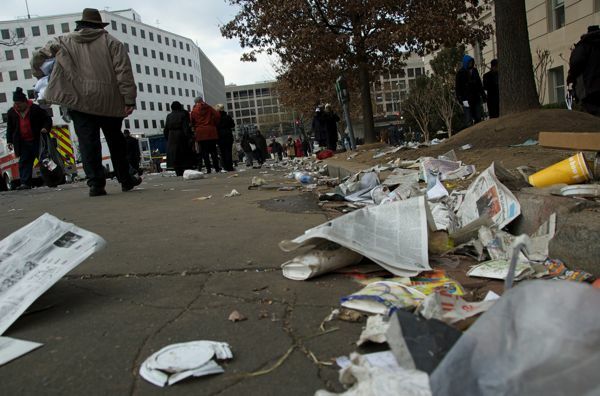 I have never seen the city as messy as it was after the ceremony. Most of it was courtesy of the TSA, which made ticketholders discard items including Thermoses, backpacks, suitcase and folding chairs. They were left behind at the gate, and the garbage cans overflowed. Some people picked through the mess, trying to find valuable items that were left behind. Later in the day, I read a Washington Post story that said, "In some places, officers stopped trying to manage the crowds as pedestrians ignored orders to stay on the sidewalks and climbed over concrete barriers for shortcuts." I'm proud to be part of the day's planned history and a part of the crowd's rebellion through an improvised exit. 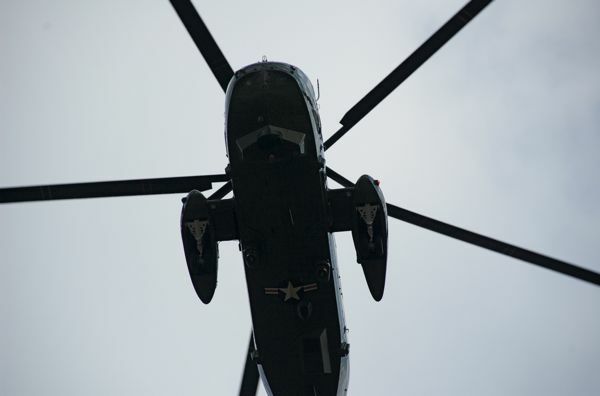 As we were leaving the mall, former President George W. Bush's helicopter flew overhead, en route to Andrews Air Force Base. The people waved and again sang, "Hey, hey, hey, goodbye."